SAN FRANCISCO: The new-for-2002 Ford Explorer has finally been launched to the general public, and might we say, it is well worth the wait. The company has pushed back the launch, from last fall, of this first ground-up redesign since its inception 10 years ago, and pushed it back again. 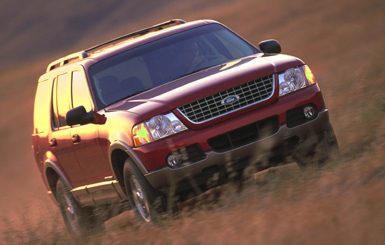 Mostly because FoMoCo wanted to make sure the 02 Explorer was perfect from the get-go. Ford took a strategic approach to this important launch in order to ensure quality and to sustain customer enthusiasm and anticipation for the newest best-selling SUV. The new vehicle is wider and the wheelbase has been extended to give more room to passengers and cargo, though the overall length and height is unchanged. Interior room is greatly improved compared to previous iterations of the four-door Explorer. This change is most noticeable in the width of the footwells up front. In the old model, the space was never tight but there could have been more room to move around. In the 02, theres plenty of room to sit any way you choose, even cross-legged! Another feature now offered on Explorer is a third-row seat, made possible by the expanded interior volume and lower floor height than in previous years. And, believe it or not, an adult can actually fit back there. Yours truly was coerced by Ford Communications Manager Harold Allen to get in the third row seat and it was actually bearable to a 5 10 adult with poor flexibility. The newly redesigned rear hatch is a marvel at ease of use. The load-in height is quite low, just above knee level, and it is very easy to open and close. The glass portion, a full piece of glass with an appliqu� of plastic trim, opens lower than last years model and is also very easy to operate. The lower bumper height is also an added safety feature, according to Doug Scott, Ford SUV marketing manager. "Safety and security were differentiating factors for this redesign," Scott said at a Ford sponsored ride and drive recently. "We are offering an optional side-curtain airbag in the new Explorer as well as bumpers that are two inches lower for better car-friendliness." Other safety features on the 02 Explorer include AdvancTrac, a stability control system that will be introduced later in the model year; the ControlSlip rear driveshaft that collapses rather than buckling; Fords Personal Safety System, which includes dual-stage airbags for front passenger and driver and seat belt pretensioners; standard four-wheel ABS; and the Safety Canopy, which is a rollover protection system created by the side-curtain airbags and a bevy of sensors that measure indicators like vehicle tilt and lean-angle changes. The grill on the 02 Explorer definitely has a family resemblance: Can you say mini-Expedition? There are new jeweled headlamps, following the current trend, that look very nice in the daylight. We didnt get a chance to drive the vehicle at night but, rest assured, Fords truck headlights are among the brightest of any automakers. Explorer owners get to choose between two distinct engines, a 4.0-liter SOHC V6 with 210 hp and 250 lb-ft of torque, along with a 4.6-liter SOHC V8 with 240 hp and 280 lb-ft of torque. Both engines meet Low Emission Vehicle standards and can operate on either gasoline or the gasoline/ethanol blend E85. A V6 powered Explorer 4X4 should see 15 mpg in the city and 20 mpg on the highway. The V8 should see 14 and 19 mpg city and highway, according to EPA ratings. Both manual and automatic transmissions are now five-speeds and both are all new for 02. Both feature revised gearing to better use the engines flatter torque curves and higher horsepower. Towing for the Explorer is handled by a standard Class II hitch thats capable of hauling 3500 pounds, depending on engine and drivetrain. An upgraded towing package, which includes a limited-slip rear differential, can handle up to 7300 pounds. almost anything that would have upset the old versions live axle. Handling through corners is equally calming. The new independent rear suspension keeps axle hop down to a minimum when that unseen undulation literally pops up, threatening to spoil any good time the driver is trying to have. The only real odd thing to driving the 02 Explorer, at least with the test vehicle, was a GM-like brake pedal feel. It was mushy to a point, and then there was decent feedback to what was happening on the road. The vehicle stopped fine; there was just a touch of confidence lost in pedal performance. Believe it or not, three out of the four Explorer models will have a lower base price, comparing 01 to 02. The only model to actually go up in price is the Eddie Bauer edition; it will be $65 more than the current model. The other three models, XLS, XLT and Limited, will feature lower prices by $95, $230 and $190, respectively. Base prices for the 02 Explorer (including $600.00 for destination and delivery) begin at $24,620 for the XLS, $28,380 for the XLT, and $32,690 for the Eddie Bauer and Limited. The volume truck, an XLT 4X4 equipped with the standard 4.0-liter V-6 engine and optional electronic AM/FM stereo/clock/single CD player, will carry a base price of $30, 475.